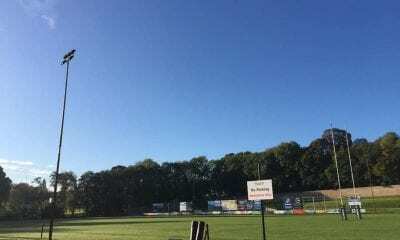 Following their two cup semi-finals, City of Armagh hosted Banbridge in the return All Ireland League fixture at the Palace Grounds. Conditions were damp with light drizzle when Armagh kicked off and immediately Banbridge went on a whirlwind attacking period that denied the home side any possession whatsoever for the first 10 minutes. On 6 minutes an attacking lineout five metres from the Armagh line saw a catch and drive by the visiting pack but a knock on let Armagh off the hook. Two minutes later the home side were penalised and Adam Doherty opened Banbridge’s account at 0-3 with a converted penalty. Andrew Willis carried well into Banbridge territory. 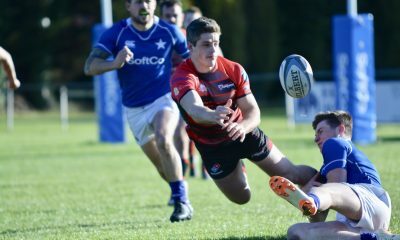 Despite being on the back foot, remarkably, it was City of Armagh who scored the game’s opening try. Banbridge were soon were back deep in the Armagh 22 and their forwards drove for the line but the home defensive line held firm. 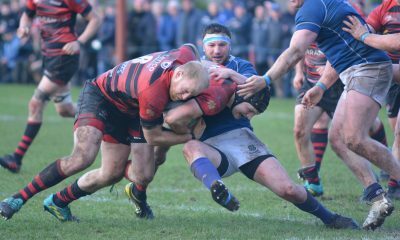 Two penalties were conceded by the Orchard County side and Banbridge went for the scrum option on both occasions. 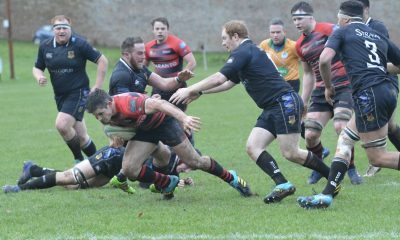 The ball was then moved the wide and slick passing from James Hume and Andrew Morrison saw Conor Field cross for the first try of the game for Banbridge. A superb conversion from the touchline by Doherty put the visitors ahead 7-10 with half an hour played. The home side won a second penalty and looked to repeat the attacking ploy but unfortunately the throw was not straight and the chance was lost. Momentum was now with Armagh however but they spurned another three points with a missed penalty on 33 minutes. Five minutes before the break, a Banbridge prop was yellow carded for a no arms tackle and Armagh looked to take advantage but again their lineout malfunctioned close to the Banbridge line. With the half time whistle beckoning, Armagh’s fortunes changed. Robert Whitten took the ball on the Armagh 10 metre line and cut through the Banbridge defence. 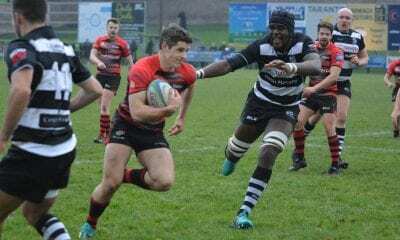 The flanker then offloaded superbly to Shea O’Brien and the young winger showed his pace to sprint in from 40 metres for a brilliant try. With no conversion, Armagh were now ahead 12-10 and the interval break arrived with the visitors in arrears, despite having had much superior possession. The second half commenced with Banbridge kicking off and an early penalty was narrowly missed by Doherty. Armagh then stole a Banbridge lineout and put together some good phases in the Banbridge half. 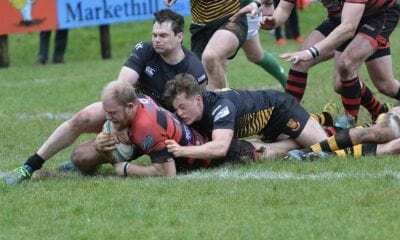 On 48 minutes, a high tackle on Crummie was penalised by the referee and number 8 Stephen Irvine was sin-binned. Armagh kicked the penalty into the corner and Banbridge infringed again at the lineout. Armagh elected to go for a scrum and won two scrum penalties and it was the Co Down sides turn to be under severe pressure. From the third scrum Armagh’s number 8 Neil Faloon picked up and drove but unfortunately the ball went forward as he crossed over the line. A huge opportunity lost for the home side. 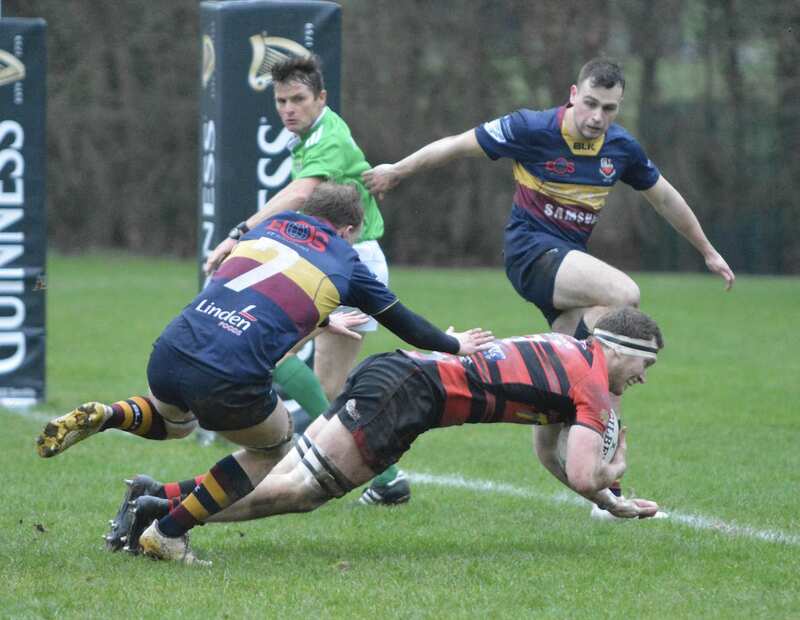 From the resulting Banbridge scrum, the visitors showed adventure by running the ball out of their 22 up to half way and Andrew Morrison kicked ahead, only for Rob Lyttle to be penalised for being in front of the kicker. Armagh returned to the attack and on 55 minutes Banbridge were penalised in front of their posts for going off their feet. Fox made no mistake from the 22 and Armagh were now ahead 15-10. 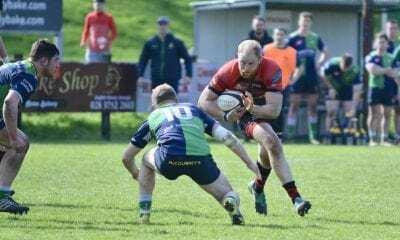 On 60 minutes Banbridge scored their second try. Armagh sent up a box kick which Irvine fielded on the halfway line and he slipped the ball to Rob Lyttle and the Ulster player sprinted 40 metres down the wing to score an unconverted try in the corner to tie the match at 15-15. 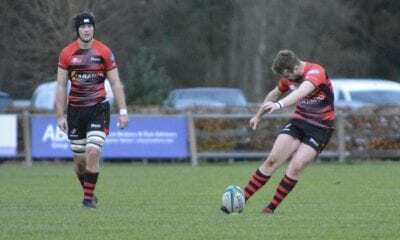 Five minutes later, the visitors took the lead when Armagh conceded a penalty and Doherty converted from 30 metres to make the scoreline 15-18. Armagh’s captain Chris Colvin then had to retire injured with Chris Cousens taking his place in the centre. The visitors raised their game as Armagh seemed to fade and good inter passing led to try number 3 for Banbridge scored by Stuart Cromie on 68 minutes. Doherty’s conversion made the scoreline 15-25 and Armagh’s best hope was for a losing bonus point. It was Banbridge however who finished the match stronger. Rob Lyttle almost got his second try, then a series of forward drives on the Armagh line had the home side creaking. The pressure told in the final minute when Ulster flanker, Caleb Montgomery burst through an attempted tackle for a valuable bonus point try which Doherty converted to make the final score 15-32. The Armagh coaching team were disappointed with the final scoreline. Willie Faloon commented: “Banbridge dominated possession but I thought our guys performed well to be leading with 20 minutes to go. “Unfortunately tiredness and errors crept in and that final quarter was very disappointing. We lost both our centres and our lineout was poor today but no excuses, we know Banbridge have one of the strongest squads in this league and they deserved their victory. City of Armagh slip to fifth place in the league table and now face a difficult trip away to Naas this Saturday.